Earlier this week I made some pulled barbecue in the crock pot, the recipe can be found here. 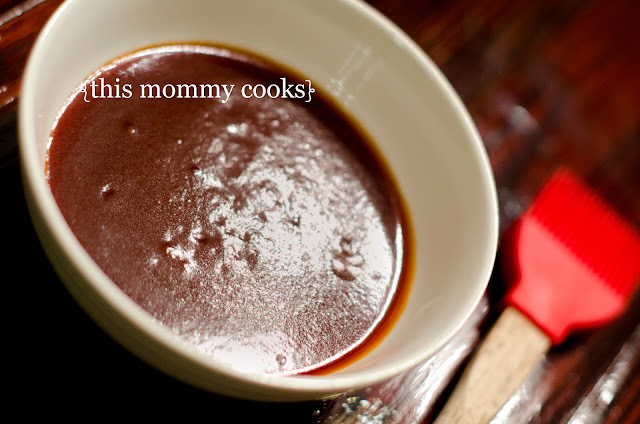 I wanted to change things up and make my own barbecue sauce. I've been wanting to do this for awhile, and this week I finally did it. The sauce and the barbecue are both easy. This recipe makes a lot, it can be halved or you can freeze it in smaller increments for future recipes. Even my 15 month old (can you believe my baby girl is 15 months old??) LOVED it! In a large saucepan, over medium heat, combine ketchup, tomato sauce, red wine vinegar, molasses, liquid smoke, and butter. Then add the brown sugar and seasonings making sure all seasonings are incorporated well. Bring to a boil and then reduce the heat to low and simmer for about 20 minutes, stirring occasionally making sure it doesn't burn the bottom. The sauce will thicken as it simmers and even more as it cools. Store in refrigerator or once cooled, the sauce can be frozen. Just thaw in the refrigerator and use as needed. makes about 6-7 cups sauce. Looks like a great sauce!